Columbia St paving & striping this week. Street work on Columbia St. The Columbia St 2-way Transit Corridor Project will complete its last segment of paving work on Columbia St between 1st and 2nd Avenues this Thursday. We’ll return to the project site this Saturday to complete striping work on Columbia St between 1st and 3rd Avenues. Both will require temporary lane restrictions. Columbia St between 1st and 2nd Avenues reduced to a single lane. Columbia St from 1st to 3rd Avenues reduced to a single lane. Today, Columbia St is a 1-way street heading westbound that connects to a viaduct on-ramp at 3rd Ave. Our project – the Columbia St 2-way Transit Corridor – will rebuild the segment between 1st Ave and 3rd Ave. The segment between 3rd Ave and Alaskan Way will be rebuilt and converted to 2-way operations as part of the Waterfront Seattle project. Once done, there will be a new cement street that can handle the higher weight of buses and an eastbound lane for transit and local access to move thousands of people a day into downtown Seattle on our new, post-viaduct transit pathway. The 6th Ave paving project is underway! Our crews will be repaving 6th Ave and are set to work between the University St and Spring St intersections, getting the work done overnight to limit traffic impacts – thinking of you, Seattle! The NB I-5 Seneca St off-ramp will be fully closed overnight. Traffic impacts due to offramp closure; please use alternative routes. Construction-related noise, dust, vibration, and concrete odor. Extra lighting to illuminate active work zones. Downtown portions of 6th Ave nearly repaved! Crews are working hard to build a new, smooth 6th Ave downtown, and they’re nearing the finish line. These closures will allow completion of paving on 6th Ave between University St and Spring St, and at the James St intersection. Access to businesses, hotels, and residences on 6th Ave will be maintained. Construction for Harbor Ave SW & SW Spokane St launches this week! Existing intersection conditions at Harbor Ave SW and SW Spokane St. Kicking it off with a lane reduction. Construction for the Harbor Ave SW & SW Spokane St Intersection Improvement project launches this week! The project will be fully delivered/completed in 6 weeks. To kick things off, please be prepared for a lane reduction at the intersection of Harbor Ave SW and SW Spokane St.
Our crews will close the WB curb lane of SW Spokane St as the street approaches Harbor Ave SW, restricting vehicle traffic to one lane, except during peak hours (3-7 PM, MON-FRI), when it will stay fully open. A uniformed police officer will direct right turns onto NB Harbor Ave SW from SW Spokane St during work hours. Sidewalks will be maintained for people walking and biking. All this to say, thanks for your patience while we make these safety improvements for pedestrians, cyclists, and drivers! This project is part of the Neighborhood Street Fund Program. For over a decade, first as part of Bridging the Gap and now the Levy to Move Seattle, the Neighborhood Street Fund (NSF) has enabled SDOT, the Mayor and City Council to partner with the community to identify, prioritize, fund and build transportation improvements in Seattle’s neighborhoods and business districts. NSF is a program that pays for transportation projects identified and prioritized by the community. Visit the Harbor Ave SW and SW Spokane St Intersection Improvements project for more information. Have questions or concerns? Email our Neighborhood Street Fund Outreach Lead, Michael Charles, at 206.733.9361 or by email at NSFHarborandSpokane@seattle.gov. THIS WEEK! | NE 45th St Viaduct EB Exit Retrofit. Mark your calendars! Our crews start this overnight work Thursday at 9 PM. NE 45th St exit ramp to EB Montlake Blvd NE closed throughout the night of Thursday, June 14. Westbound access to Montlake Blvd NE will be maintained. NE 45th St EB will be re-routed around University Village via Montlake Blvd NE, 25th Ave NE, NE Blakely St and Union Bay Pl NE back to EB NE 45th St. Flaggers will be on site to help direct traffic on Montlake Blvd NE and NE 45th St.
King County Metro bus stops will run as planned throughout the closure. Access will be maintained for those walking in the project area. Please follow all posted signage. Expect nighttime noise, dust, and odors related to construction activities. Visit the NE 45th St Viaduct Retrofit site for more information. Have questions or concerns? Email Adonis Ducksworth at Adonis.Ducksworth@seattle.gov or call (206) 684-4193. Smooth, new panels coming to NE 45th near I-5! Concrete work to replace patchy westbound sections. 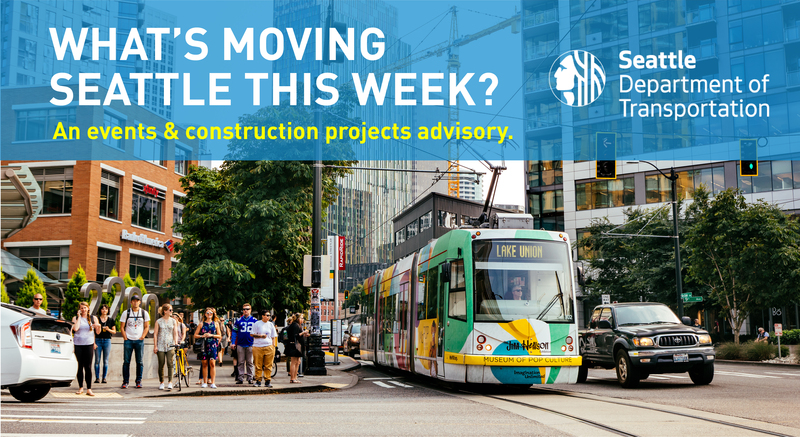 This weekend and next, our concrete team will be replacing about half of the NE 45th westbound bus pullout lane and far right lane, just west of 7th Ave NE. These lanes receive high volumes of traffic, especially buses. Mass transit moves people efficiently but does so with great mass—impacting the pavement. The new panels will improve the street surface for people in buses, on bicycles, and in cars. One westbound NE 45th travel lane will be open, between 5th Ave NE and 8th Ave NE, for 24 hours/day, June 16-17 and June 23-24. Eastbound lanes are not impacted. Work hours are 6 AM to 8 PM, with overnight hours for the concrete to cure. Trucks wanting to turn west onto NE 45th St from 7th Ave NE will be detoured to NE 50th St. Flaggers will be on site during work hours, at the 5th Ave NE and 7th Ave NE intersections. Follow posted signage. Thanks for your patience while crews make these improvements! Have questions or concerns? Contact Jim Sheffield at James.Sheffield@Seattle.gov or 206-472-3895.